While Jimmy’s musical path was inevitable, this Alabama native and son of a music professor, will be remembered for not only the company he kept - Cab Calloway, Nat King Cole, Mel Torme, Rosemary Clooney, Joe Williams and Lionel Hampton - to name a few; not only for the venues he played, from symphony halls to major supper clubs throughout the United States; not only for the performances he delivered, including the 1989 Bush/Quayle Presidential Inauguration; but also, for his commitment to education, service and mankind. He was also inducted in the Jazz Hall of Fame’s Class of 1984 along with ten other jazz superstars, including Ella Fitzgerald, and in the Indianapolis Jazz Foundation Hall of Fame Class of 1998. In his lifetime, Jimmy McDaniels led by example in the classroom, field, profession, stage and community. He excelled as a student at Miles College, the Toledo Bach Conservatory, Indiana University and as an education specialist with the Indianapolis Symphony. McDaniels served his country as aparatrooper with the U.S. Army 82nd Airborne Division and served his profession as a member of the Indianapolis Musicians Union Local #3. This dedicated member of the Indiana Performing Arts Hall of Fame, the Alabama Jazz Hall of Fame, Sertoma, 100 Black Men, Tuskegee Airmen and the Kiwanis Club also served as the volunteer organizer of a jazz band at the Pendleton Reformatory. For this achievement, he received the Governor’s Award for outstanding service to the Indiana community. In his lifetime, James “Jimmy” McDaniels truly made a difference. James “Jimmy” McDaniels was born in 1929 in Vinesville, AL as the second of four sons of music professor Charles A. McDaniel and Mrs. Willie Viola Selden. All of the brothers were saxophonists and learned to play the piano as well. They were required to practice daily and expected to play their saxophones in an annual Christmas carol serenade throughout their neighborhood. Jimmy went on to graduate from Fairfield Industrial H.S., Miles College, and the Toledo Bach Conservatory. In addition, attending Indiana University for graduate studies in music and psychology, and later teaching a jazz course at Butler University and Indiana University in Special Topics in Music Series -The Roots of Afro-American Jazz in 1981. 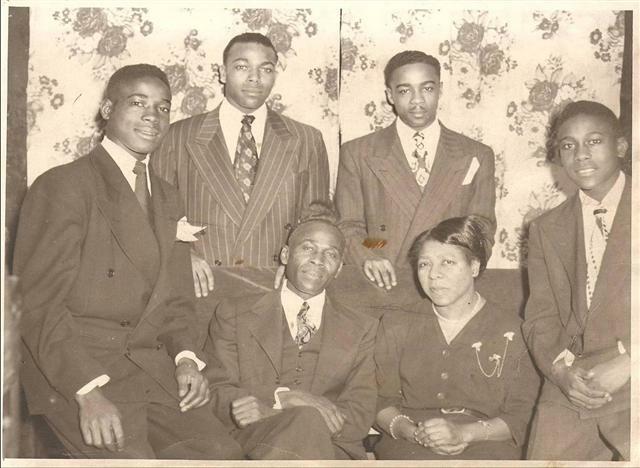 Jimmy with his brothers and parents.